Artist Andy Gracie is attempting to breed a strain of fruit fly that could survive on Titan, Saturn's largest moon. The first stage of his work, The Quest for Drosophila Titanus, is part of an exhibition currently touring the UK. What can people see if they visit Dropsophila titanus? Currently, the installation consists of a homemade Titan simulation chamber, some video of the flies being exposed to different conditions in the chamber, a lab manual I made during the experimental process and some dead first generation specimens that you can look at under the microscope. These are the prototype Drosophila titanus. It is the proof of concept for a work I will be developing next year. Why breed a fly that can survive on Titan? Although Titan is hostile to life, until last week - with the discovery of a potentially habitable exoplanet - it was the most Earth-like place that we know of. And in about three to four billion years, the Sun will expand so much that Earth will become uninhabitable, but perhaps then it might warm up Titan sufficiently to make it an environment in which extreme forms of life could survive. 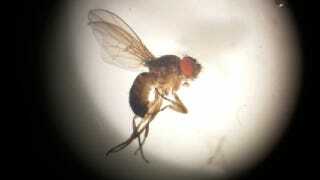 The fruit fly, or Drosophila , is an iconic organism in biology. It is the field's model organism — it's had its genome sequenced and countless other experiments done on it so it is an organism we know almost as well as a machine. Humans share a huge percentage of our genome with the fruit fly so experiments on them give us clues to how humans might respond. How did you recreate the conditions on Titan? The air pressure on Titan is fifty percent higher than on Earth so I used a bicycle pump and pressure gauge to increase the pressure in the chamber to 21.2 bar. That was probably the most authentic recreation of the conditions. Titan is a frosty -190 degrees but it would have been pointless exposing flies to that temperature as they would all die. Instead the idea is to use freezer elements to take down the temperature a few degrees at a time and try to selectively breed for resistance to low temperatures. The radioactive element from a smoke alarm simulated the radiation found on the moon and a series of UV LEDs represented the harsh UV rays that rain down. There were a couple of constants - Titan has a deep orange sky so I used orange LEDs to recreate the spectral qualities. Low frequency radiowaves also seem to emanate from Titan, so I used audio from Jupiter and Saturn radio emissions to represent this. How did you select the flies to survive? The flies were kept in a cylindrical experimentation chamber and exposed to these different conditions sequentially for half an hour at a time. The males and females were separated and both went through the entire sequence of experiments. Afterwards if there was only one left, I choose that one to breed from. If there were several then I chose the ones that seemed to be the most active or the most unaffected by the experiments. I am also interested in process of selection itself, not only in terms of choosing which fly to breed from but also the politics and social science behind how we choose who goes into space. I was influenced by Tom Wolfe's book, The Right Stuff, and subsequent film. The idea is that the astronaut should be the perfect physical and political specimen. You had to be the right kind of person, have the right attitude - be a good family man, citizen, American - as well as having had a distinguished military career to be chosen. I wanted to play on the idea of a fly having the "right stuff". In a way, the fruit flies become the potential astronauts that we can't, they are our proxies. Do you see it first as an art or science project? It originally started out as an artistic project, but I am also interested in how I can run a metaphorical, speculative artistic project by following a completely rigorously scientific process. This means every artistic decision I make has to be accompanied by a rigour check. Has your insistence on scientific rigour been frustrating as an artist? Yes! We artists are used to have a large degree of freedom for our thought processes. When doing the prototype for this project, I allowed myself a freer reign, but I plan to tighten it when I start the real thing. For example, the rain on Titan is liquid methane but it is really hard to use liquid methane in a homemade lab environment so I used its chemical cousin, vodka, instead. I quite like the humour and metaphor behind using vodka but I'm not going to allow myself to do that next time as there is no point in testing fruit flies' tolerance to vodka if I am breeding them for an environment where there is no vodka! So, what form will the final installation take? I'll possibly rethink the experimental set-up as I'd quite like to have a whole battery of experimentation chambers going on at the same time to make it more of a monumental art object. I also want to investigate using technology to automate it so it could run without me being there. In terms of the science, I'll use more flies and leave them in the chamber for a longer time. There are also other conditions I'd like to test such as exposing the flies to constant orange light or constant dark to simulate the lack of day and night on Titan. The Quest for Drosphilia titanus is on display as part of the Republic of the Moon exhibition at FACT, Liverpool, UK from 16 December to 26 February 2012, and will tour the UK thereafter. The programme is curated by The Arts Catalyst and FACT. Top image: The Quest for Drosophila titanus, Andy Gracie/2011. This post originally appeared on New Scientist.